I came across a tutorial for this over a year ago, before it got really popular (or at least from what I’ve noticed). Record bowls are a beautiful piece of art for cheap! I found mine at the thrift store for $1 each. They can be used to hold a variety of things. They can even be used to put plants in. 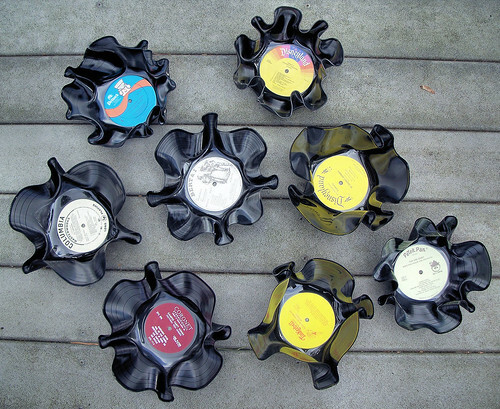 Now, there are a ton of tutorials on how to create a bowl from a record. I tried a few of the different ways and combined ideas to make them the way I liked best. To find tutorials, just google how to make a record bowl, but here is a video that shows how simple it is. – I did 220 degrees F for 6 minutes and I found that some of the records were thicker than others and needed a little more time in the oven. -After taking it out of the oven, I removed the record, flipped the bowl over, put the record in the bowl and smooshedit down with a smaller bowl to create the look I liked best. NOTE: I STRONGLY RECOMMEND USING POT HOLDERS/ETC.!!!!! THE BOWLS AND COOKIE SHEET WILL BE HOT AND SO WILL THE RECORDS!!! II also read somewhere, that if using the bowl for food, it would be best to use an acrylic sealer on it. Last night I had a blast making record bowls. So easy. I melted them over the smaller bowl, then took the big bowl and smooshed it down over it, flipped it, smooshed some more. They turned out great, thanks for the idea and tips!!! Also, when I picked the records from the Thrift Store, I made a point to pick colorful/interesting album covers. I’ve cut out stars and balls from them to make ornaments. I’ll send a pick when I’m done. That’s a cool idea. I can’t wait to see pics :)Have a great Christmas! And to this I just got rid of all my LP’s in the last couple of years… They would have made great bowls especially the Xanadu album and a couple of others by ELO.